When the sun starts shining and the temperatures start to rise, it’s time to get outdoors and enjoy the world, and there’s no better place to go on a warm, sunny day than the beach. All around the world, coastal locations attract huge numbers of visitors, with people of all ages and backgrounds adoring the comfort, beauty, and activities offered by the beach. Whether you’re looking to head out on the water for some fishing, sailing, or surfing, or simply rest and relax on the warm sand with friends and family, beaches offer a myriad of fun ways to pass the time and make memories that will never be forgotten. With an exceptionally long coastline stretching out along the east, west, and southern sides of the country, America has more beautiful beaches than one could hope to see in an entire lifetime. All around the country, people gather at shoreline locations to enjoy the beautiful views and soft sands of America's beaches, and the New England region has some of the finest beaches in all of North America. With several major port and coastal cities around New England, like Portland in Maine, there are plenty of super beaches to choose from. Residents of Portland, Maine are lucky enough to live just a short distance away from some of New England’s prettiest beaches. For stunning seascapes, super seafood, sandy fun, and some splendid surfing opportunities too, Portland is a great place to be. With that in mind, let’s take a closer look at some of the best beaches in and around this Maine city. Ask any Maine resident for their favorite local beach and there's a good chance they'll respond by mentioning Old Orchard Beach. Conveniently located for Portland residents and people in the surrounding area, this beach has been one of the top spots in the state for many years and has a lot of history behind it. The main feature of Old Orchard Beach is its 500 feet pier, which hosts weekly firework shows and all kinds of other live entertainment. Lots of great shops and amusements can be found in the area too, giving visitors to Old Orchard Beach a lot of different things to do. Parking is easy and lots of amenities can be found on-site, so if you want a stress-free beach to spend a full day, this is the one for you. Located in the southern part of Portland, Maine, Willard Beach has proven to be a big hit with locals and tourists alike. It's very convenient for people staying or living in the city and covers around four acres of land, offering beautiful views of the nearby island forts like Fort Gorges and the iconic Spring Point Ledge Light sparkplug lighthouse. There's a nice play area for the kids to enjoy and there's always something interesting to observe from Willard beach, with lots of sea traffic like fishing boats and ferries passing by at all times of day. The water isn't the best for swimming due to the dangers of the rocky shoreline, but Willard Beach is a good spot to simply sit and relax. If you have an adventurous spirit or love to surf, Scarborough Beach is the best spot for you in the Portland, Maine area. It's almost impossible to visit this beach without spotting a few young surfers searching for the next big wave, and the currents can get quite choppy out there, so this Portland beach is definitely one for youngsters to go paddling on. Lifeguards are always on duty to keep everyone safe, but visitors are encouraged to avoid swimming or surfing out too far unless they have a lot of experience. The water temperatures can get very high at Scarborough Beach, however, so it's a nice spot to stroll along the water's edge on a summer day. Not far from Scarborough Beach, Ferry Beach is also known under the name of Western Beach and looks out onto the Scarborough River Channel. It's a secluded little spot beloved by locals and ideal for heading out on the water in a canoe or kayak. On-site amenities include concessions, restrooms, and showers, but there aren't any lifeguards, so it's important to keep an eye on little ones. Lots of little crabs can be spotted scuttling around this beach, making a fun spot to walk around as a family. Only a short drive south of Portland is Crescent Beach State Park at Cape Elizabeth. Named due to its unique crescent-shaped formation, this beach is filled with rolling dunes and has developed a reputation as one of the best spots for families to spend some time by the sea in the Portland area. The beach runs for around a mile in length, providing more than enough space for everyone, and offers some lovely views of local landmarks like Kettle Cove and Richmond Island. The nearby boardwalk is a great place to grab a snack or cool drink on a hot summer day, and lifeguards are always on duty at this beach too. The Native American name of this particular Portland beach translates to "beautiful place by the sea" and it's easy to see where that name came from. 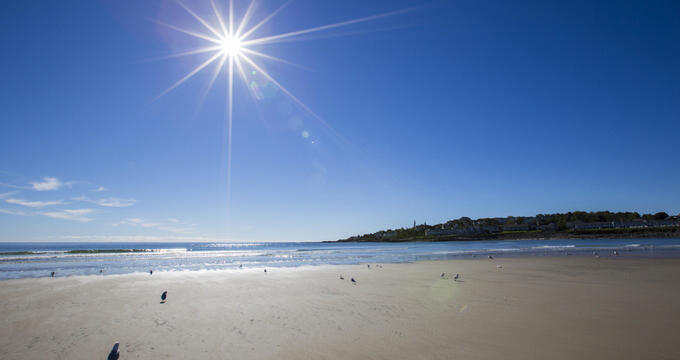 Ogunquit Beach offers a breathtaking sight from any angle, with wide stretches of sand and bright blue waters stretching off as far as the eye can see. Many artists have visited this spot and attempted to capture its beauty on a canvas, and it's a popular place for photographers too. Be warned, however, this beach is almost entirely underwater during times of high tide, so it's a smart idea to plan ahead and consult tidal charts before planning a visit.